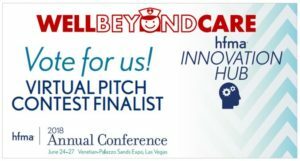 Austin, TX, Jun 12, 2018 – Well Beyond Care has been selected by the Healthcare Financial Management Association (hfma.org) as one of the top 12 startups that can most influence the healthcare industry out a pool of over 100 candidate companies that submitted their ideas to a nationwide contest. As a finalist, the Company has been invited to attend the annual HFMA meeting (annual.hfma.org) as a spotlight company in this year’s Innovation Hub and take part in the Virtual Pitch Competition. The annual meeting is taking place in Las Vegas, Nevada, from June 24th through June 27th. Well Beyond Care was selected due in part to the way the Company can impact 4 out of the 8 most critical content areas (see graphic below) outline in this year’s mission, including Reducing Total Cost of Care, Creating a Consumer Centric Healthcare Delivery System, improvement to Payment Trends and Models, and leveraging and capturing Trends and Innovation. Part of the criteria of being selected was how well a company would affect at least one of the following outcomes. Reducing Cost of Care Delivery: Product, service or technology that quantifiably reduces the cost of care delivery through its implementation or utilization. Enhancing the Healthcare Consumer Experience: Product, service, or technology focused on specifically improving the healthcare consumer experience in facets such as patient satisfaction, care coordination, price transparency, communication, etc. Improving Population Health Management through Analytics: Product, service or technology providing analytics that lead to better health and outcomes of patients. Areas and products in the realm of wearables, mobile or telehealth, monitoring, or other digital tools. Presently, Well Beyond Care is operating in 44 States and territories and has clients in over 350 cities. The company did its “hard-launch” in the first quarter of 2018 and is looking to hire upwards of 500 nurses this year as it continues to expand its footprint across the United Stares. The company is also starting to partner with not-for-profit and public hospitals in order to reduce readmissions and improve outcomes.